Recently, I kicked a man in the head so hard that he backflipped off a cliff. You should have heard the thud. I almost felt bad, but he was between me and a mound of rocks, which I knew contained treasures – perhaps a new mask to give my face extra protection from incoming head kicks. I don’t want to go the way of Cliff Dude, after all. Turns out it was some hand wraps. I killed a man for bandages. If you enjoy killing folk for minor upgrades, check out our list of the best RPGs. 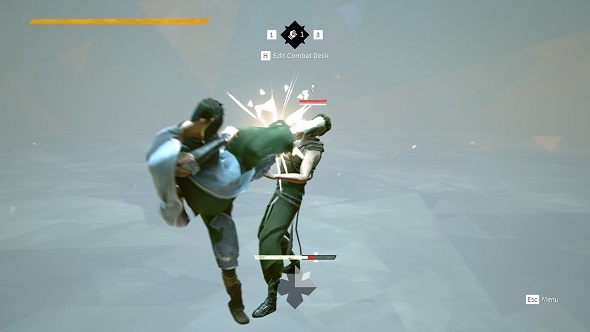 Absolver is a game about mastery. Even exploring its pastel-coloured, hauntingly quiet world becomes second nature as you play – the three main areas, each overlapping and folding back on themselves, eventually feel like a second home. 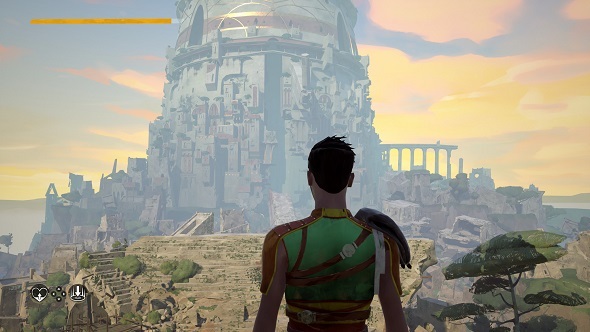 You can only see a simple map – a stripped back overview of the three zones and its central hub – at rest points called shrines, but the real map is the one you create in your mind as you explore Absolver’s fallen empire, kicking people in the head as you go. Over its story’s eight hours, you’ll trudge through misty marshland, you’ll cross ruined battlements and precarious wooden bridges, you’ll wander through sun-dappled forests, explore abandoned villages, and uncover an impossibly ornate library – all of it adorned in the most wonderfully muted art style. Initially, it feels a bit aimless. Your only objective is to track down a handful of sub-bosses called Marked Ones, and tackle a trio of tougher boss encounters. Combined with the game’s vague story – which is only told through clumsy exposition by a handful of NPCs – it leaves you wondering what the point of it all is. Thing is, as I eventually found out, those eight hours are essentially an elaborate, pretty, and clever tutorial for the main event: fighting other players. 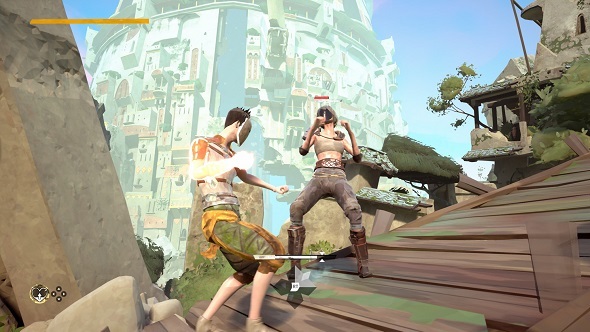 The world of Absolver is populated with enemies that constantly respawn, each kitted out with different moves. As you fight your way through them, you’ll come up against countless combat styles and be forced to adapt. As you guard, dodge, and parry incoming hits, you slowly fill a meter for each specific technique. Killing the enemy then locks that progress in, and once the meter is filled for a move, you learn it. It’s a clever way to tease you into a defensive mindset, even when fighting AI. Every fight is a lesson. It’s when you’re exploring that you’ll also encounter other players. One of my favourite moments was hearing the satisfying crunch of punches landing nearby. I sprinted to the source of the noise just in time to see the another player downed, his enemy standing over him with a slither of health. I ran in and superman-punched him in the back of the head, sparking him out before grabbing the felled player by the hand and reviving them. It was PCGamesN freelancer Fraser Brown. We just happened to stumble into each other. Obviously, we went hunting for Marked Ones and YouTubers together. Absolver’s combat feels incredible. The audio work and animations lend heft to every blow, and the system’s intricacies become second nature through repetition. 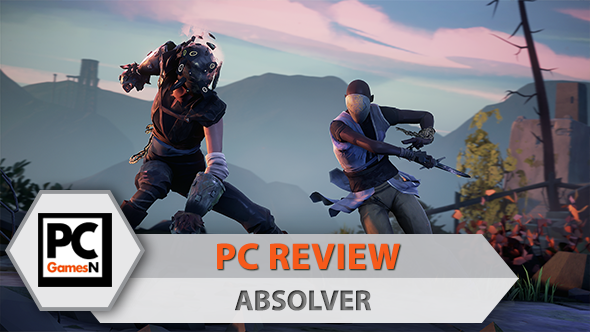 Just as Absolver’s world quietly leaves its imprint, you’ll soon find you’re fighting by reflex alone. Initially, it seems simple: one button is for light attacks, one for heavy attacks, another dodges, and you can guard. Those ‘heavy attacks’ aren’t actually heavy attacks, though – at least, not if you don’t want them to be. Each technique is represented by a card that you can lay out into sequences in your Combat Deck. There are four stances, which can be flicked between at any time, which essentially represent your orientation in relation to the enemy. For example, my dude, when his back is to an enemy, has a sharp backfist, cross, high kick combo on the ‘light attack’ sequence. For his ‘heavy attack’, it’s a wild, spinning haymaker. Whichever I use, the final blow leaves me oriented so I’m directly facing my opponent, meaning I can launch straight into my front-facing combo. That one ends with a left-facing stance, which in turn leads back into my first combo. You can build these combos however you see fit, but clever placement lets you flow them into each other seamlessly. Heavy attacks, however, interrupt this flow, breaking your combo and leaving your opponent guessing as you switch to a new orientation and continue the assault. Because every player you fight has a different style, each brawl is an opportunity to learn something new: there are the sharp elbows and knees of Muay Thai practitioners; you can use the snappy, untelegraphed backfists and low kicks of Jeet Kune Do; you can harness the unpredictability of a drunken master, flailing wildly and using unorthodox movement to catch your opponent off-guard; and you can possess the raw power of Big Dave from Wetherspoons, throwing wild, Saturday-night, Stella Artois-fuelled haymakers. Firing up your Combat Deck, you can practise these techniques on the AI, seeing how your combos flow, creating your very own hybrid fighting style. Mine’s Kirk Fu. There’s even a completely different deck for your weapons – a sword or some combat gloves – but I barely encountered anyone who used them during my time with the game, most likely because they require you to spend a resource best saved for healing. To add to this complexity, there are also different classes, each with an ability attached to the controller’s right stick: one soaks up damage and can deal it back with an uninterruptable, powerful strike; another can slip punches and lean away from kicks; while my own class is built around parries. Stamina management is crucial if you want to win fights, and these defensive techniques are essential to keeping yourself topped up. Keep attacking a blocking enemy and you’ll eventually break through their guard. There are even techniques that speed this process up – jumping elbows to the skull, for example, or a Muay Thai teep. The only ways to offset this if you’re the one under attack are to dodge aside and counter, or use your right stick technique – a well timed parry creates an opening and feeds you a chunk of stamina. As you keep fighting the same opponent, you soon learn their combinations, their timing, and which direction their next attack will come from, making parries easier. Like in boxing, the first few minutes of a fight are often spent feeling your opponent out, seeing what tricks they have up their bandages. This is where an extra layer of tactics comes in – if your opponent starts to read your moves, you can use cancels to feint. Blocking straight after an attack cancels it, letting you launch into a different attack or to slightly change the timing of your sequence, throwing off their parry. It’s like a violent, beautiful dance. When you’re against someone who’s not as good, you can really showboat, beating them with well-timed slaps as you dodge, block, and parry everything they throw at you. 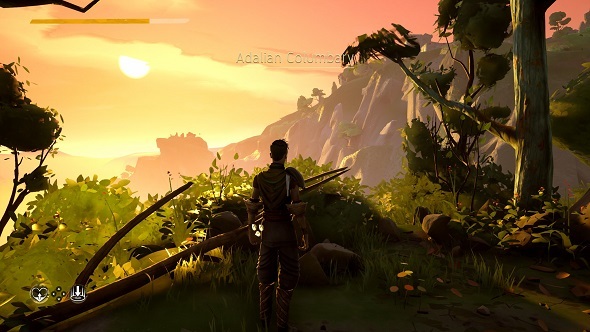 Absolver feels very special when it works as intended. Its status as an online, peer-to-peer game, however, has meant that connection issues have impacted my experience. Yesterday, I had six hours of perfect PvP with no issues at all. Last Friday, I was teleporting around and flailing at another player who, presumably, was actually over the other side of the arena, making me look more drunken idiot than drunken master. I just hope these issues are ironed out for launch, because they’re a stain on an otherwise excellent fighting game that’s quite unlike anything else. The endgame is all about becoming an Absolver, donning a cloak to signify your status as a person who’s finished the campaign. After you’ve beaten enough players, you can create your own fighting school and recruit newbies, sparring with them and letting them absorb your moves. It’s a clever idea, and it’s thematically consistent because it’s quite the grind to unlock your own school. By the time you do, every parry will be a reflex. You won’t be kicking people off a cliff for some bandages, you’ll be doing it simply because you can.